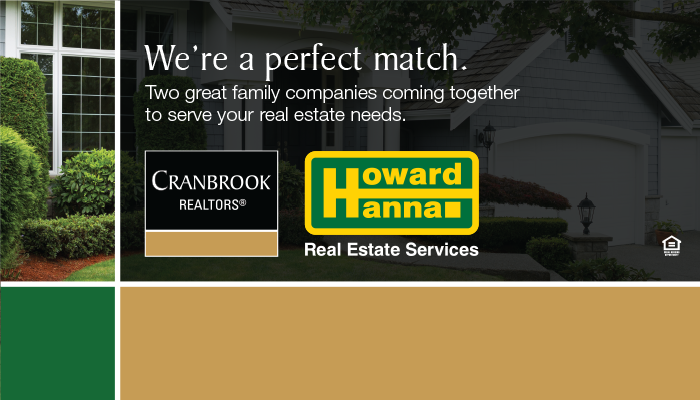 Birmingham, MI (September 13, 2017) – Howard Hanna Real Estate Services, the third largest real estate company in the United States, is pleased to welcome Cranbrook Realtors to the Hanna family of companies. Cranbrook Realtors has been serving Oakland County and the surrounding areas for over 45 years with offices in Birmingham and Franklin. A well-respected local real estate broker, Cranbrook Realtors will now be able to provide their 70+ professionals with Howard Hanna’s marketing tools and business resources. Agents and clients will now be able to buy with confidence using Howard Hanna’s exclusive programs, among them the 100% Money Back Guarantee. Luxury sellers will have access to the high-end Homes of Distinction program, offering expanded marketing along with a high level of service to new and returning clients. “Our luxury home business will benefit with the Homes of Distinction program Howard Hanna offers. The tremendous listing tool of 100% Money Back Guarantee will set us apart from other real estate companies,” added Wolf. Howard Hanna Real Estate Services is the 3rd largest real estate company in America, the #1 privately owned broker in the nation, and the largest home seller in Pennsylvania, Ohio, and New York. The family-owned and operated real estate company specializes in residential and commercial brokerage service, mortgages, closing and title insurance, land development, appraisal services, insurance services, corporate relocation and property management. With 259 offices across MI, OH, PA, NY, VA, WV, NC and MD, our more than 9,000 sales associates and staff are guided by a spirit of integrity in all aspects of the real estate process.